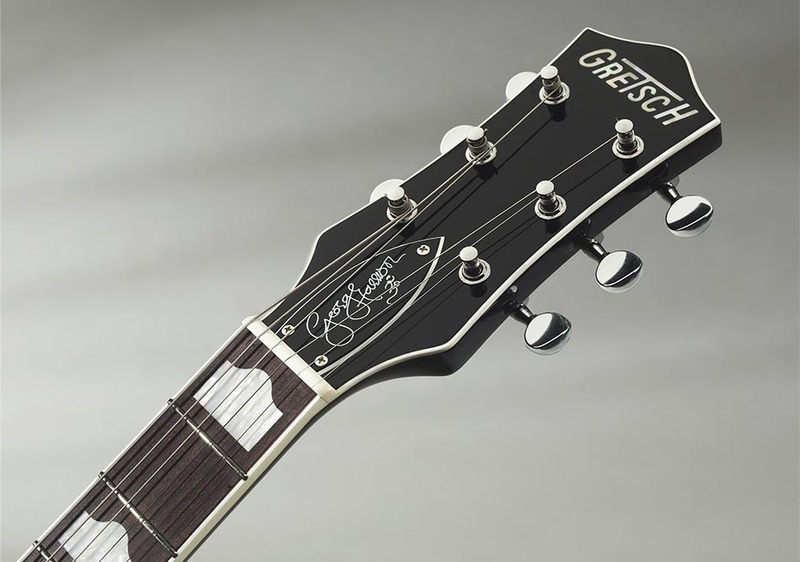 Gretsch celebrates the legacy of George Harrison with the G6128T-GH George Harrison SIGNATURE Duo Jet® guitar, modeled on the instrument that the legendary guitarist often referred to as his "first real decent guitar." There's a very famous early film of the Beatles performing at Liverpool's Cavern Club; the dank, cramped cellar where the group played from February 1961 to August 1963. The grainy black and white footage captures the Beatles (mere days after new drummer Ringo Starr officially joined) sweating through a raucous cover of "Some Other Guy," then a staple of their act, before a packed house. 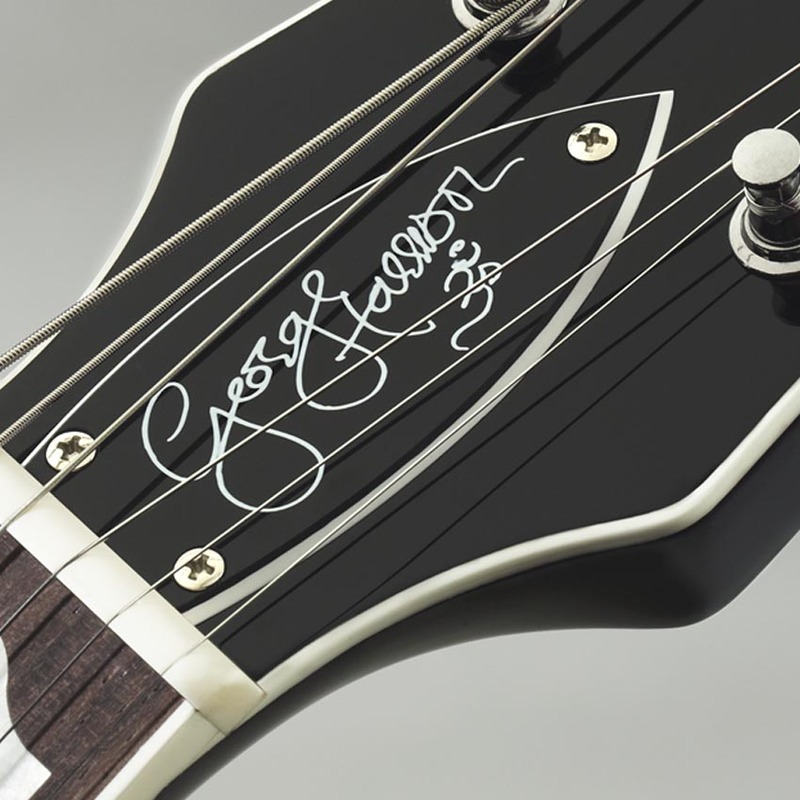 At far stage right, 19-year-old guitarist George Harrison is blasting out the song's infectious chord progression on what he later called his "first real decent guitar"— a black 1957 Gretsch 6128 Duo Jet, serial number 21179, with a Bigsby® vibrato unit. The guitar is clearly visible in the footage. The Gretsch Duo Jet that Harrison plays in the clip was dear to him at the time. He often referred to it as his first truly good guitar. He'd bought it secondhand from a Liverpool cab driver a year earlier at age 18, in summer 1961. After acquiring the guitar, Harrison played it during the historic three-year period when the Beatles made their momentous transformation from local favorites to U.K. sensations to worldwide phenomenon. He used it to record the Beatles' first album, Please Please Me, and the song of the same name that was their first number-one hit. A quarter-century later he returned to the guitar for his acclaimed 1987 solo album Cloud Nine. 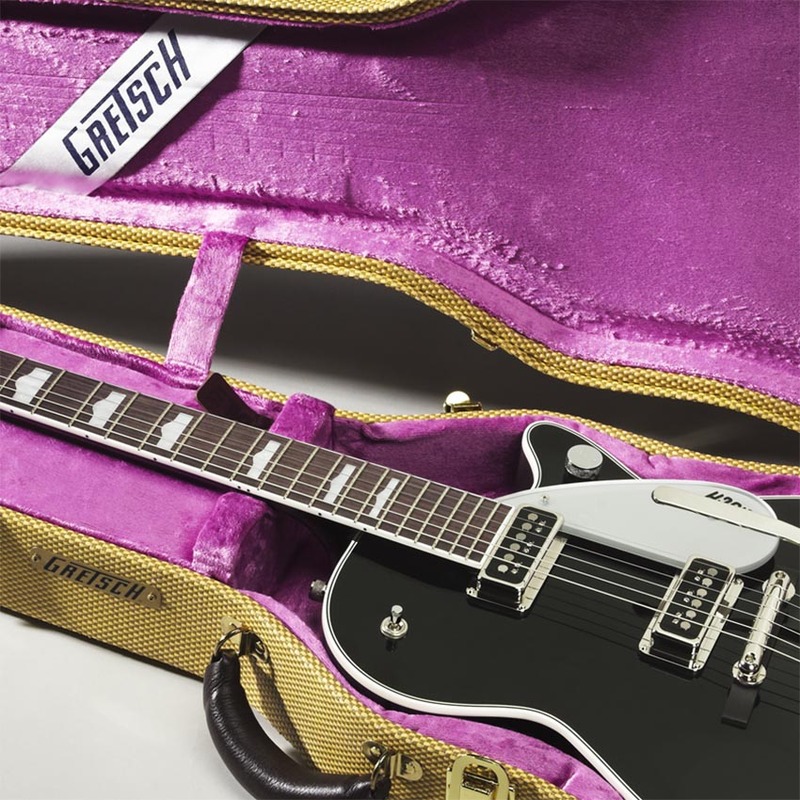 In 1957, Cunard Line merchant seaman Ivan Hayward bought a '57 Gretsch Duo Jet brand-new for $210 in New York at a small guitar shop near Manny's Music on West 48th St. near Times Square. 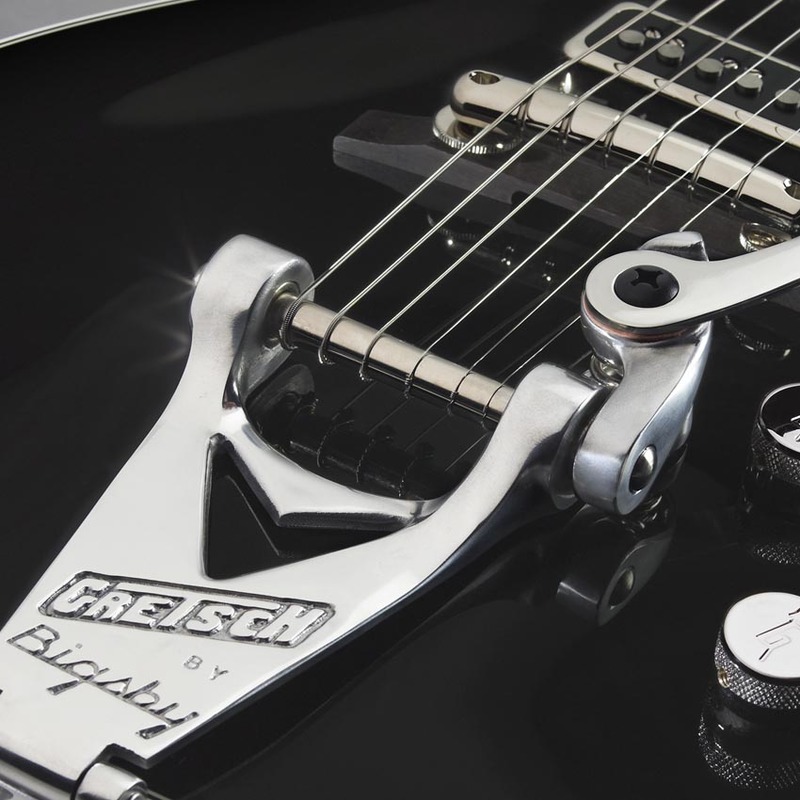 Soon afterward, he bought a Bigsby® tremolo unit for the guitar at Manny's and had it installed, which meant that the strap button on the lower bout had to be relocated just above its original center position. Four years later, in that summer of 1961, Hayward was back in his hometown of Liverpool and driving cabs for a living. He had decided somewhat reluctantly to part with his Gretsch, so when a Liverpool trio called the Delacardoes hailed his cab one night, he asked them if they wanted to buy a Gretsch electric guitar. They politely declined, but told Hayward they'd put the word out among friends. Delacardoes sax player Neil Foster knew the Beatles' original bass player, Stuart Sutcliffe, from school, and he knew a Gretsch guitar was a rare find. "I am sure it was the only one on Merseyside at that time," Foster told Liverpool newspaper Mersey Beat. Sure enough, Hayward soon got a phone call from George Harrison, the young Beatles guitarist. Harrison, who arrived dressed in black leather pants and jacket that seemed at odds with his good-natured politeness, seemed like "a nice kid" to Hayward. "He asked me to play something for him, so I played a few things for him—you know, rock solos," Hayward said. Harrison had been playing gigs since age 16 on a poor-quality Futurama electric guitar he bought in late 1959 that was as difficult to play as it was odd to behold. 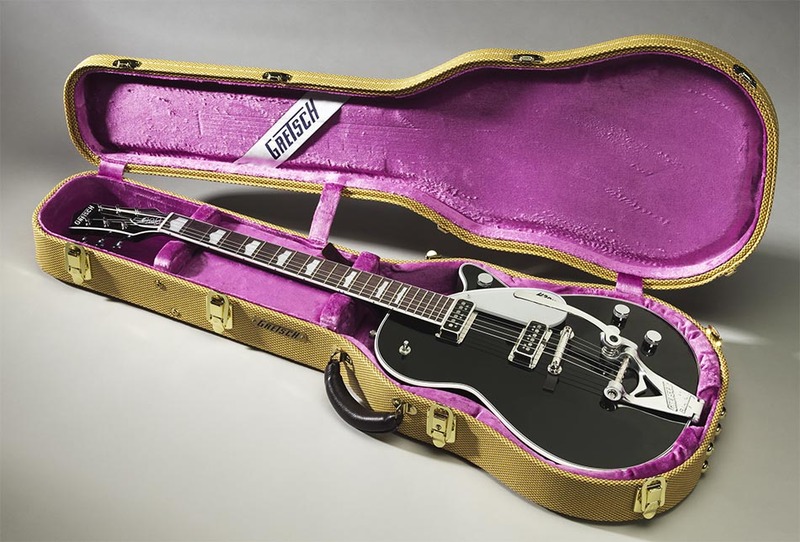 A Gretsch—a real U.S.—made Gretsch guitar—wouldn't merely be a step up in quality and prestige; it would be a quantum leap. Hayward wanted £90 for the guitar, but Harrison had only £70. Seeing Harrison's earnest eagerness and appreciation of the instrument, Hayward accepted the £70 along with an IOU for another £20, scrawled on the back of the guitar's customs slip (since settled, Harrison fans will be interested to know). "It was my first real American guitar," he told Guitar Player magazine in 1987. "And I'll tell you, it was secondhand, but I polished that thing. I was so proud to own that." Indeed, Harrison had procured a truly fine guitar for himself—no small feat for an 18-year-old in Liverpool, where any good guitar was hard to come by, let alone a U.S.-made Gretsch. It immediately became Harrison's main guitar. In addition to the Beatles gigs at the Cavern and other spots in and around Liverpool, this meant that the Duo Jet also accompanied the young guitarist on several of the Beatles' visits to Hamburg, Germany. Harrison played the guitar during their 1962 stints at the Star-Club in April, May, November and December. This was a wild and formative chapter in Beatles history; Hamburg was where the group honed its live show and musicianship during grueling marathon performances, widened its reputation, lost a certain amount of innocence and recorded and released its first single ("My Bonnie," backing singer Tony Sheridan, June 1961). When the Beatles (which still included drummer Pete Best) and road manager Neil Aspinall arrived at London's Abbey Road Studios on June 6, 1962, for their EMI/Parlophone audition, the guitar Harrison brought with him was his Gretsch Duo Jet. They recorded four songs that day: a cover, "Besame Mucho," and three originals, "Love Me Do," "P.S. I Love You" and "Ask Me Why." Except for the all-acoustic "Love Me Do," all the songs included Harrison's Duo Jet. It was on the basis of this "audition" session that Martin decided to sign the Beatles. Harrison retired the Duo Jet in spring 1963 when he acquired other guitars including the Gretsch Country Gentleman® and Tennessean® models. In the mid-1960s, he gave the Duo Jet as a gift to bassist and artist Klaus Voormann, a longtime friend of the band from the Hamburg days well known to Beatles fans as the designer of the seminal 1966 Beatles album Revolver, as well as the mid-'90s Beatles Anthology albums. 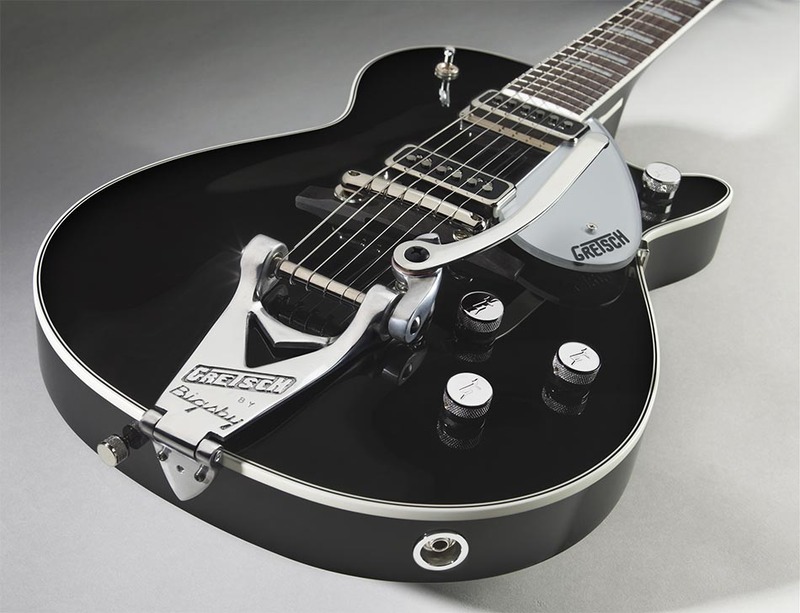 Voormann kept the Gretsch for the next 20 years, at some point changing the neck pickup. In the mid-1980s, Harrison recalled, "I'd asked him what happened to the guitar and whether I could have it back, because of its nostalgic value. So he returned it to me, and I had it fixed back in its original form with the original pickup and switches that had been missing from it since he owned it." For these late-1985/early-1986 repairs, Harrison turned to noted U.K. guitar tech Alan Rogan, with whom he had worked before. Rogan in turn entrusted the restorative work to luthier Roger Giffin, who rewired it (because "the original wiring was disintegrating") and installed a spare DeArmond® pickup in the neck position that was much closer to the original than the neck pickup Voormann had installed. In 1987, Harrison released his critically acclaimed and enormously successful Cloud Nine album, which included a massive hit in "Got My Mind Set on You" and a charming tribute to his Beatles years in "When We Was Fab." When the time came to shoot pictures for the cover, Harrison said, "I was asked if I could take a guitar down for the photo session for the new album, and so I picked that one, and that's it—the old black Gretsch." The cover of Cloud Nine shows a beaming Harrison holding his old Gretsch Duo Jet, back in his hands after more than two decades. As such, there is perhaps a touching symmetry to the notion that Harrison started his career and returned to it decades later for yet another enormous hit album with "the first real decent guitar" he ever had; the one he bought at age 18 with money he'd worked so hard to save from those early Beatles gigs in Hamburg and in the dank confines of the Cavern. 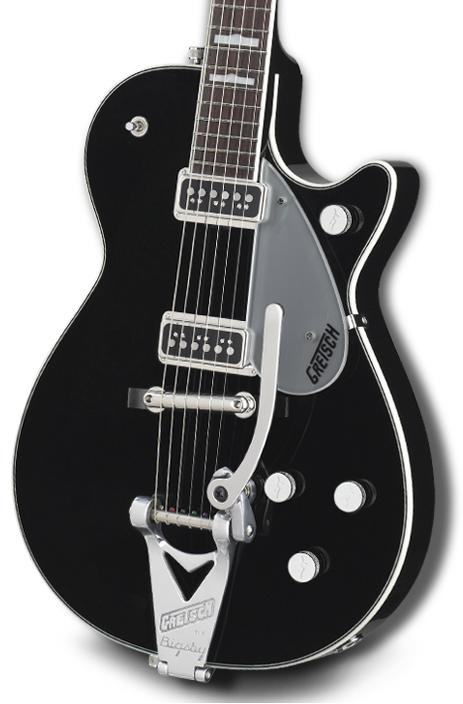 The one he affectionately called "the old black Gretsch."